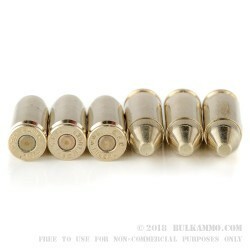 An ideal target round, these highly effective paper punching 9mm rounds from Fiocchi feature a 124-grain full metal jacket truncated projectile, loaded into boxer-primed, noncorrosive, reloadable brass cases. Capable of a muzzle velocity of 1150 FPS, these rounds are accurate even at longer distances and are perfect for training drills or a fun day at the range with your buddies. The truncated projectile leaves perfect little circle holes in paper and is a great round for match shooting where clear scoring is important. 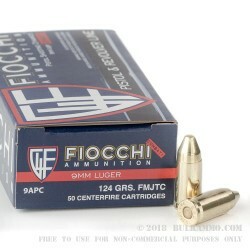 Each box of Fiocchi 9mm 124-grain contains 50 rounds. 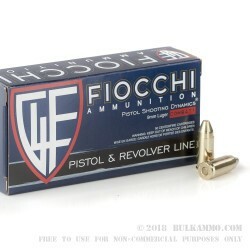 From their main manufacturing plant in Via Santa Barbara, Lecco Italy, Fiocchi continues to be a trusted producer of quality ammunition for a wide assortment of civilian, professional and tactical shooters and is now also produced in the US. Beginning in 1876 with Giulio Fiocchi, the company has grown to possess a production facility the United States and is still a family run business with Carlo Fiocchi at the helm.